The site boasts many features that have in the past attracted manufacturing plants. For Okaloosa County, the past year has been a stage-setting one on the economic development front. Central to that effort was a vote by county commissioners to secure a purchase option on 1,700 acres located on Interstate 10. The parcel is part of the 11,000-acre Shoal River Ranch and also offers frontage on U.S. 90 and a CSX railroad line. With site selection consultants and others, the Economic Development Council of Okaloosa County, headed by executive director Nathan Sparks, has been talking up the site for about four years. The purchase option makes things more real. Prospective tenants are likely to be encouraged, too, by the county’s successful application for Triumph Gulf Coast dollars — money recovered by the Florida attorney general for economic damages that resulted from the Deepwater Horizon oil spill — for extending sewer and water lines along U.S. 90 to the site. The amount of the award was $1.4 million. That positive feedback led the council to strongly encourage the county to take steps to tie up the property. Too, the council has made it a point to study what went right in Alabama leading up to the decision by Toyota and Mazda to locate a plant in Huntsville. The planned $1.4 billion plant, called Project New World, will represent a joint venture between the two automakers. The plant is expected to employ 4,000 workers at an average salary of $50,000 and to produce about 300,000 vehicles a year. Already, Huntsville is home to a Toyota engine plant. Toyota president Akio Toyoda cited his company’s experience with Huntsville’s high-quality workforce as a key factor in the decision to build an assembly plant there. Economic development officials in Alabama first started promoting the Huntsville property 10 years ago when Volkswagen was shopping sites for a plant that ultimately went to Chattanooga, Tennessee. That plant, which commenced production in April 2011, employs more than 2,000 workers and churns out about 150,000 Passats a year. Sparks views the Alabama success as an example of what can happen when local officials heed the advice of people like site selection consultants in positions of influence who believe that a particular property can be made competitive with the right strategic approach and investment. “Because we already have been focusing on this site for three or four years, it’s not going to be a 10-year effort for us,” Sparks predicted. “We’re a good ways down the road, and certainly the option that the county has on the property and the application for Triumph funds for water and sewer improvements helps solidify the case for this property. Plus, Enterprise Florida is very much a partner in this effort. Sparks and his team have brought the Shoal River site to the attention of heavy equipment manufacturers, in addition to automakers and to tire companies who may wish to build research and development facilities including a test track along with a manufacturing plant. In conversation, however, Sparks continued to return to auto plants. “Twenty years ago, Alabama was not a player in the auto sector,” he said. “But the state and community worked diligently to become competitive and to identify the right real estate options, and they have grown a tremendous cluster of auto-sector businesses. Plus, Sparks has the advantage of selling an attractive county where people genuinely want to live. So attractive is the county and so robust is its economy that, at this writing, Oklaloosa’s unemployment rate, at just 3 percent, is the lowest in the state. That, from Sparks’ standpoint, can be problematic when courting employers looking for a readily available workforce. To combat that problem, Sparks and the EDC have embarked on “talent-recruitment strategies” that involve emphasizing Okaloosa County’s quality of life, its outstanding schools and natural features and amenities that make the area desirable. “We’ve been digging deeper to discover how many of these people stay here after retiring or separating from the Air Force and cataloging the skill sets they possess,” Sparks explained. Via survey work, Sparks and the EDC learned that many of the people in that population perceived that there were no job opportunities for them upon separation. Improving the retention of the “hidden workforce,” then, has been largely a matter of education. So it is that the EDC conducts an Early Bird Job Fair intended for people who will be leaving the military in a year or so. The fair enables them to position themselves for post-military career employment well before their separations occur. The effort is paying off. In three years, the percentage of new veterans in Okaloosa County sticking around has jumped 10 points to 41 percent. Even as it works to tap into the military community, the EDC is working to foster a sense of community and identity among Okaloosa County’s defense contractors. The EDC’s TeCMEN (Technology Coast Manufacturing and Engineering Network) committee meets monthly and brings together representatives of contractors big (Boeing and Lockheed) and not so big. In the past year, the EDC conducted its first TeCMEN Industry Day, which included 45 exhibitors, some from as far away as Washington State and California and others from the northern Gulf Coast — Eastern Shipbuilding of Panama City and Airbus from Mobile, Alabama, to name a couple. Academic and workforce development partners are joining with the EDC in pursuing Triumph funds. Northwest Florida State College is seeking funds for aviation technology and hospitality programs and a simulated city that would be built near DeFuniak Springs. All three proposals have cleared the pre-application phase. The aviation technology program would supply airframe and power plant mechanic training. Sparks notes that some 200 aircraft mechanics separate from Hurlburt Field each year but don’t have A&P [airplane and powerplant] credentials because they are not required by the military. The new program would supply them with the certifications they need to work in commercial aviation. The simulated city would accommodate utility company employees, first responders and emergency management personnel engaged in studying disaster scenarios. The contemplated hospitality program would offer both associate’s and bachelor’s degrees. “Our one-two punch in Okaloosa County is defense and hospitality,” Sparks stressed. The University of West Florida is seeking Triumph funds for an innovation center that would include a campus in Fort Walton Beach. The proposal anticipates prototyping labs and steps to increase the availability of 3D printing. 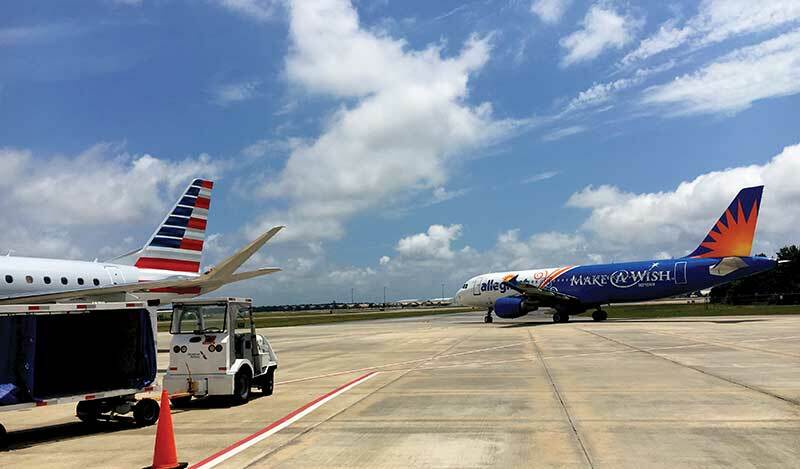 In February, the hospitality industry got a boost in the form of an announcement made by Allegiant Travel Company, which is establishing a new, two-aircraft base with year-round routes at Destin-Fort Walton Beach Airport (VPS). The base will create 65 new jobs and bring an anticipated $418 million in tourism revenue to the area over the next five years. Allegiant is investing more than $49 million to establish the year-round base, which will house two Airbus aircraft. The new Destin base will also allow Allegiant to offer new routes to five cities. In May, Allegiant will permanently locate two Airbus A320 aircraft at VPS and hire permanent local employees. One of the unique focuses of Allegiant is to bring customers from previously underserved destinations, not to compete for existing market share. Allegiant’s service in Destin-Fort Walton Beach began with six routes in 2016 and expanded to 16 cities in 2017. The new Destin base will become the airline’s 14th year-round aircraft base. Allegiant planned to immediately begin hiring pilots, flight attendants, maintenance technicians and ground personnel to support operations. Positions are expected to offer average salaries more than double the area’s average wage. Overall, Sparks said, the economic outlook in Okaloosa County is positive. Sparks sings the praises of the county’s Tourist Development Council, citing a string of years that have seen records for visitation. And he gave a shout-out to American Elite Molding, newly recognized by the state as a Florida Manufacturer of the Year.